Whilst servicing goes on throughout the year on any farm, winter is the time for repairs or any major maintenance jobs. 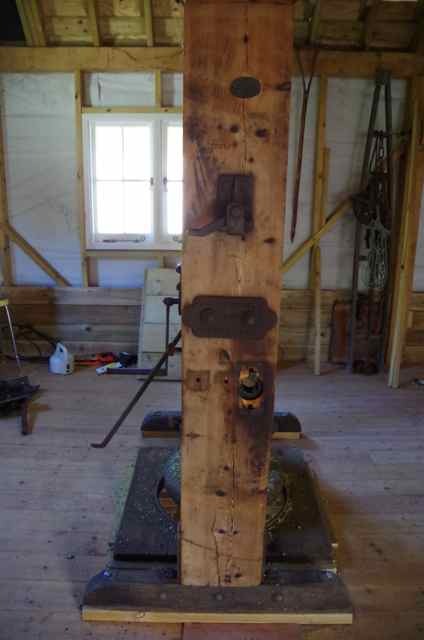 This year the hand hop press, which was a very special gift, needed repairing. This ancient J L Larkworthy from Worcestershire wasn’t exactly broken but when it was used last September for the first time since 1982, it had thrown up a problem that definitely needed fixing before next year. 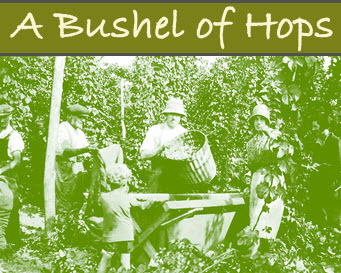 The hop press works by using the inherent weight of its stem combined with its gearing. 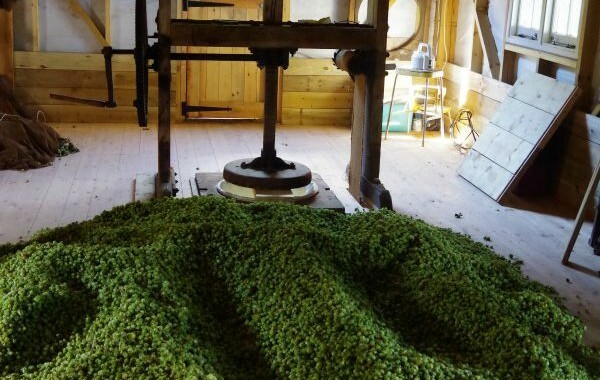 The hop pocket is supported underneath by a sling below, the top being secured by a ring at floor level and when the empty pocket is filled up with loose dried hops, the press is put out of gear allowing the pan to fall utilising gravity and its own weight to do the initial stage of each pressing for you. You then put it back into gear and wind down the handle to apply the final pressure needed on each pressing before winding it back up to repeat the process all over again. 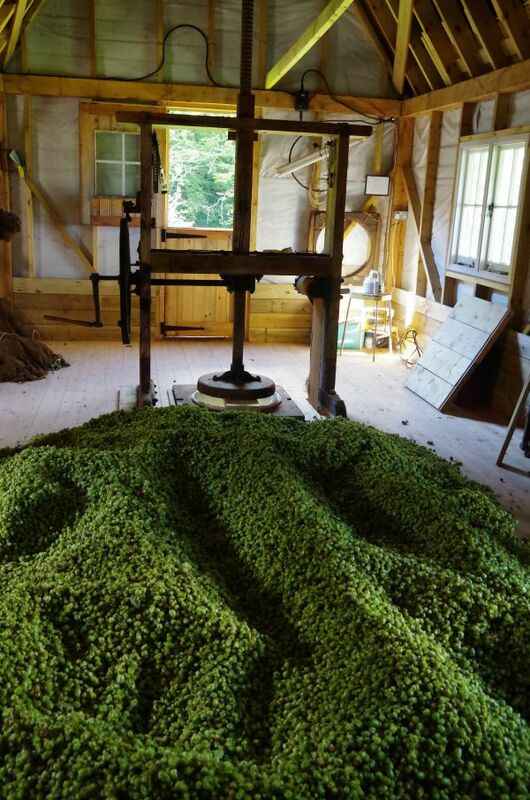 You simply repeat this sequence until the hop pocket is full of pressed hops. 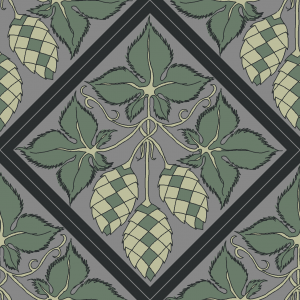 Each pocket will usually take 8 to 12 pressings to fill, depending on the variety of hops. The pocket is then sewn up and dropped out to the chamber below in a traditional oast and the next pocket put in. In a modern oast, pockets are often pressed into a hole in the concrete floor and then winched out. These days pockets are in fact fast being superseded by square bales which are smaller, easier to lift and move on pallets and more efficient to stack in a warehouse. What’s to go wrong? 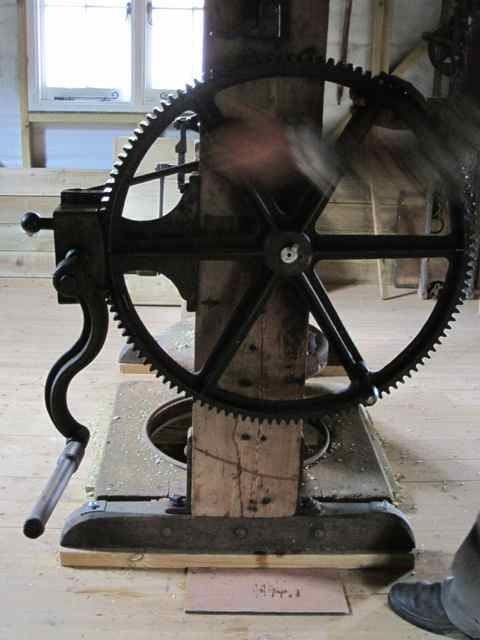 Well nothing one would imagine with a hand winding mechanism, all that is needed is to keep the hop press well oiled. However, the out-of-gear initial ‘free fall’ is an important part of the process as hand winding throughout the whole process would make the work painfully slow and tedious, hence you want the press to do what it was designed to do, which is a good percentage of the work for you. The large wheel here weaved out of alignment by an inch, so naturally we thought the cast iron wheel itself was slightly warped. That in itself, though not perfect would have been fine. However, when using it with hops underneath, it was the first time it was able to be put out of gear to free fall – omg what was that? there was a horrible noise as the cogs on the outside of the large wheel hit the edges of the cast iron casing which hold the gearing, then as the wheel weaved lopsidedly an inch to the other side it touched the main gear cog. Each of these contacts was by only a smidge, but a smidge would be just enough to cause the cast iron teeth to shear off eventually, hence it was top of the list of priority ‘get fixed this winter’ jobs. Oddly it did not hit the sides when it was wound throughout by hand. 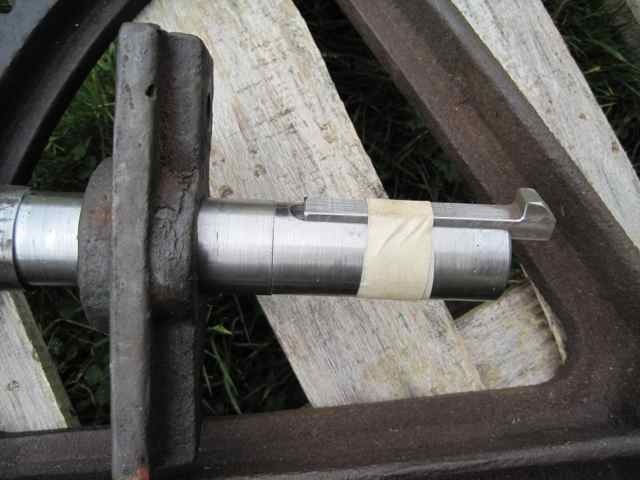 The large wheel was removed along with the shaft but it was not the wheel that was bent as we had thought, it was only the very end of the shaft which protrudes from the main press body to hold the large drive wheel, it was barely noticeable at a quick glance. 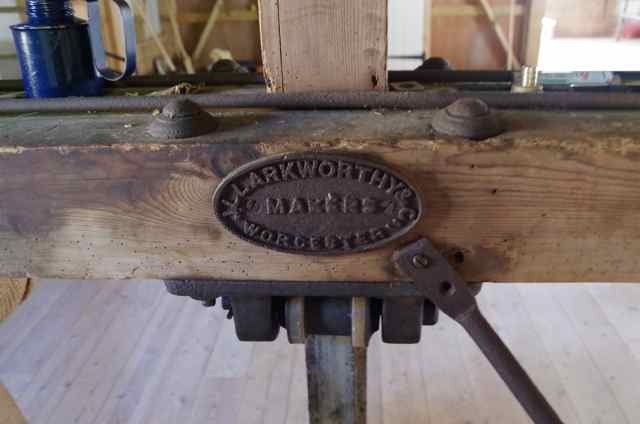 This press was built as a hand press around 1900, converted to be used as an electrically operated press in 1970 it was used as such up until1982. The forces are much greater when powered by an electric motor, hence it is most likely that over this 12 year period with these extra forces, this was when the slight bend at the shaft end occurred. This did not show up until it was brought out of retirement and converted back to be used as a hand hop press 33 years later. 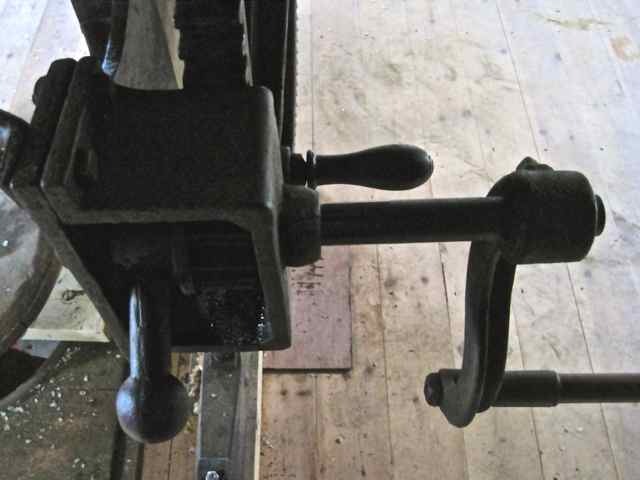 I do not think there are many or indeed any hand presses being used nowadays, they would simply not be efficient on any large farm. We took the large drive wheel and shaft to a local engineering firm to be straightened as much as possible and a new key-way was rebuilt. The wheel will always show a very slight weave but this is quite acceptable, the shaft is still original, it is part of its history now and it no longer hits other parts of the frame, so does not matter. 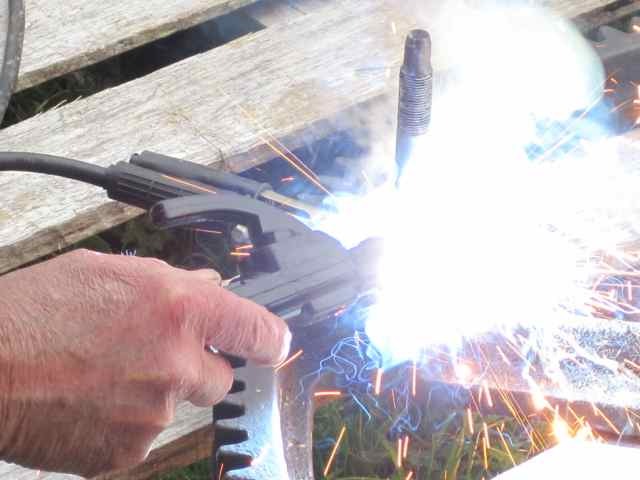 Taking things off an old press is one thing but reassembly is quite another, it does not go exactly as you think it should and once the shaft had been straightened it had knock on effect on other bolts and alignment of the metal fixings. With the wheel off my husband had put on the original handle that had to be cut off when the hop press was electrified. Beautiful, now fully resorted it’s as good as new and rearing to go. It will save us pounds up went the cry. We built the shed and laid concrete. whether it will work is any ones guess. The bines went straight up and over the top. The anchor wires snapped and down it all came!